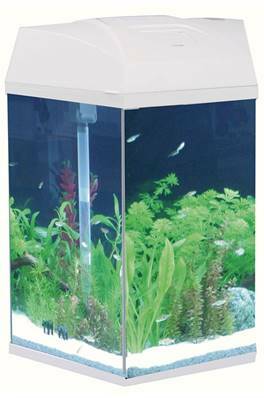 Fish R Fun High quality all in one Black hexagonal glass C Series aquarium with built in filter & fluorescent light, ideal for the office or home. These aquariums have a multifunction hood and fitted fluorescent light (with on/off switch). The hoood also incorporates a silent water pump with advanced 3 stage pressurised Filtration System (Mechanical, Chemical & Biological): utlilising filter sponge, activated carbon & bio balls in the filter compartment. Available in Black, Pink & White colours.